Suzanne's Tribe: Lost & Found: Valentine Blog Hop! 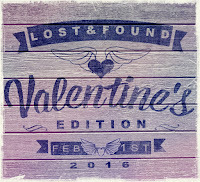 Lost & Found: Valentine Blog Hop! Decided to resurrect my blog on Saturday, saw this on Sunday and signed up! I was 16 and working at a Little Chef in my spare time while I was at college. And I met 'Him', the first boy that made my stomach turn somersaults. He was 2 years older and had that typical bad boy look and attitude. I went to a Catholic all girls school - how was I not going to fall for Him? Sadly He belonged to someone else so we remained friends. He left a few months later and life moved on. Had a few casual boyfriends, but none that made me feel like He did. One Thursday I got a phone call from work to ask if I could go in and cover as they were short staffed. After hours clearing up I was catching up with the other girl Joanne as we tended to work opposite shifts; and we started chatting about Him. How I wished nearly every day I hadn't said no and we wondered how He was doing. That night a car crashed into Joanne's back garden. It was packed with teens. One died. Him. My first love. The last words he ever said to me. And dying in the garden of the person I was working with the same evening. Was just too much. Sounds like something from that Fake or Fiction TV series? Only it's true and breaks my heart whenever I think of it. Heart breaking. There are so many losses in life, so we have to focus on the blessings, otherwise, we would lose ourselves. Oh my god Suzanne! That's heartbreaking. I'm so sorry. How sad! That's a tragic loss. That was a big blow and a situation that you'll never forget. I'm so sorry that it happened. So, so sad. There was a guy who became one of my good friends in high school and we both seemed like we were on the same track. Then his dad got brain cancer. Everything changed for him. I went to his funeral a few years later after a car crash as well. It was bewildering. Oh, wow... How very, very sad. I had a crush in high school that died, though that was suicide (well, they said it was an accident, playing with his dad's shotgun or something, but... no one that knew him bought it), and it's crap to have to deal with something of that magnitude at an age where we're all about living as intensely and wildly as possible. Did you hear the wind whoosh out of my lungs when I read the ending of your story. Then to find out it is true leaves me breathless. These experiences stay with us forever. Thanks for sharing your story. Truth is stranger than fiction. What a horrible loss! Popped by from the Lost and Found blog hop. Wow, so very sad. I'm sorry, that had to have hurt deeply and leave a scar. I hope you've found an even truer love! Wow. I guess it wasn't meant to be. HE was meant for somewhere else. By the time I got to the end of your post, I was thinking that you had written a flash fiction piece. But, no. That was all real. So sad. oh wow, that is one of the saddest things I've read! How tragic. And you're left with those final words. I can see how it can still be heartbreaking after all these years. That is heart breaking. The kind of story you wish was fiction. Hugs. Oh, what a sad, sad story. I can still why it still breaks your heart whenever you think about it. Thanks for sharing. That's a heart-breaking story. We never know at one time what will happen later. If we did I guess the outcome's of sad stories would be far different.